AllegroMedical.com presents The MET-Rx Creatine - Unflavored Creatine Supplement. 100% Pure Creatine Monohydrate. Promotes muscle strength gains. Accelerates power and recovery from exercises. Helps increase strength and power. MET-Rx Creatine Powder is a key, foundational Supplement for athletes, bodybuilders and anyone who is looking to get the most out of every Workout. Adding the recommended amount of Creatine to your daily regimen will help support your muscle strength, power and recovery from High-intensity exercise. 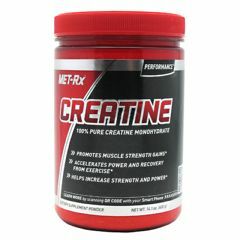 creatine also enhances The ability to produce higher muscular force, Especially during short bouts of maximal exercise. This can result in increased reps during lifting! MET-Rx Creatine Powder is made up of Creatine Monohydrate, which helps promote exercise Performance, helps promote athletic performance and helps increase strength and power.